Lower income doesn't mean lower standards, just different priorities. 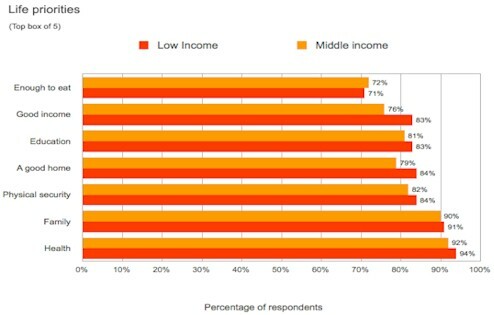 Low income consumers in the world's emerging markets want many of the same things out of life and the same quality in their products as middle class consumers and differ mainly in their purchasing behavior, according to a recent global study by Synovate. Synovate surveyed over 8,000 consumers in 14 'Hotspots' markets (Argentina, Brazil, China, Egypt, Hungary, India, Indonesia, Mexico, Poland, Romania, Russia, South Africa, Thailand and Turkey) to gain a better understanding of their attitudes, values and purchasing habits. Health, family and physical security are the top three most important things in life for more than 80% of low and middle income consumers, followed by a good home, an education and a good income. Over 33% of respondents strongly believes that in five years things will have improved for them. 22% of low income consumers would put additional savings under their bed; only 65% would trust it to a bank. Despite the income gap, low income consumers will use additional income in a manner similar to those from the middle classes. 38% of low income consumers would spend their extra income, 47% would save or invest it and 15% would pay off debt. 34% of middle income consumers would spend it, 56% would save or invest it and 10% would pay off debt. Not surprisingly, where the two groups of consumers do differ substantially is in product ownership. Many more middle income consumers own personal computers and cars; and have bank accounts and credit cards. However, mobile phones are no longer the domain of the rich and middle classes, with over two thirds (67%) of low income consumers owning a mobile phone, compared to 84% of middle income consumers. Synovate found that the key to future growth in many countries lies in low income consumers' access to credit, as well as a marketer's ability to understand purchasing habits and preferred communication channels. Notes: For the purposes of this analysis, low-income consumers are defined as the bottom quartile of the population and middle-income consumers are the second and third quartiles.